Convienent Single Part Brushable Latex Rubber Mould-making Compound, simple and easy to use. Simple Apply by Brush or Spray. Extremely elastic for easy release from master model. Can be tinted or painted, popular for manufacture of Latex Masks, Sculpture and Plaster moulds, texture stamps, LARP ( live actiion Role Play ) props, and many more applications. 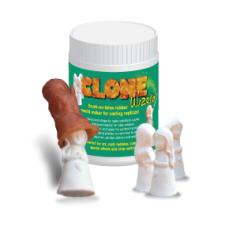 • Apply a thin coat of latex with a clean soft brush. Ensure every detail is fully painted and no air bubbles are present. • Allow first coat to dry for 30 minutes. Apply coats every 30 minutes until at least 7mm thick. • For best results, apply in thin coats. Drying times may vary according to ambient temperature. • Drying times may be accelerated using a gentle source of warm air, such as a hair dryer. • Leave to cure for 12 to 24 hours. When fully cured the latex will turn a golden brown colour. • Carefully peel the rubber mould off the item. • The rubber mould can then be filled with plaster, cement, concrete and some resins. • When dry, the rubber mould can again be peeled off to reveal a perfect replica of the original item. The mould can be used again and again.